ECSU senior, Benjamin Artman, second from right, placed first with other HBCU teammates during the annual IMB HBCU Hackathon in Raleigh. 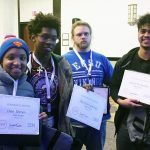 For the second consecutive year, Elizabeth City State University Computer Science students attended an IBM-sponsored HBCU Hackathon event, and walked away with first-place honors. This year’s event was held in Raleigh in November. 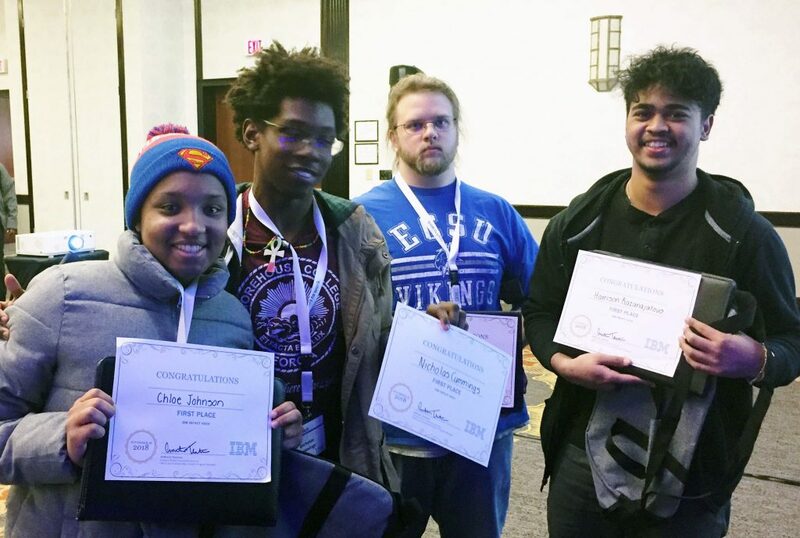 IBM’s Hackathon events invite students attending Historically Black Colleges and Universities (HBCUs) in United States to compete on a five-member team in a 30-consecutive hour competitive hacking event. The HBCUs attending the event included Morehouse, North Carolina A&T, Bowie State, Florida A&M, Albany State, and more. Benjamin Artman, an ECSU senior Computer Science major from Elizabeth City was on a team comprised of students from Bowie State, Morehouse, Prairie View A&M, and Virginia State. Their team created a Smarter Home System that monitors your utilities, such as water, electricity, gas, etc. This system could provide data about those aspects of your house when needed. Their specific concept focused on water use using IBM’s Watson technology. The system could give advice about usage in an effort to reduce consumption. Artman said his overall experience was good, although he was initially anxious because he was not sure what to expect. The experience provided him a boost of confidence in his ability to perform well in the field of Computer Science. It also required him to measure his skill level with and against other participants in the competition. Artman said ECSU has prepared him to compete on nationally, believing that attending a small HBCU in northeastern North Carolina does not limit what you can accomplish or obtain in the professional world. Artman said this opportunity has positively affected his life beyond the competition and is hoping to hear from IBM about his pending status of internship/employment offer to come as he approaches graduation. In last year’s event, held in Atlanta, Georgia, seven ECSU Computer Science students were divided into two teams and both teams placed third in the competition. Three of those students completed 2018 summer internships in North Carolina, Texas, and California.